Are you looking for an SUV that rolls up in style? One with signature appeal that has heads turning? Then the Lincoln Navigator could be ideal for you. At Merlin Lincoln, we offer you high quality Lincoln vehicles that will make you fall in love at first drive. We’ve got our entire inventory online, so you can browse through all the models and narrow down on your favourite one. There’s no better place to find a Lincoln Navigator for sale in Saskatoon! The Lincoln Navigator has an elegant exterior, indulgent interior, and tons of luxurious features. It has best-in-class second- and third-row legroom. Customize the seating to suit your needs with the one-touch tilt-and-slide second-row seats and a power-reclining third row. Auto-folding side mirrors project a welcome mat on the ground when the SUV senses you approaching. Choose the Lincoln Navigator you like best, then come to us and we’ll help you the rest of the way. We’ve been serving happy customers in Saskatoon since 1946. We invite you to come buy your next vehicle with us. Call us at 306-931-1900 or come to 3750 Idylwyld Drive N in Saskatoon, SK today! We’ve served the drivers in Saskatchewan since 1946. A great selection of Certified Pre-Owned and new Lincoln Navigator vehicles for sale. Visit us today! Why trust your Lincoln Navigator to anyone else? Merlin Lincoln prides itself on providing you with only the best Lincoln vehicles. Each vehicle is taken through a 200-point inspection by factory-trained technicians before becoming a part of our collection. That’s why we can offer 72-month/160,000 km Comprehensive Limited Warranty Coverage because we know our vehicles are just that good. Speaking of good vehicles, the Lincoln Navigator is a full size luxury SUV with best-in-class second-and-third-row leg space. Its one-touch tilt-and-slide second-row seats and a power-reclining third row give you the ultimate experience of comfort. Find your next vehicle at Merlin Lincoln today! Serving the drivers of Saskatoon and beyond since 1946, Merlin Lincoln offers a great collection of Lincoln vehicles for you to choose from. We provide friendly service that goes beyond the purchase, and extends for the lifetime of the vehicle. 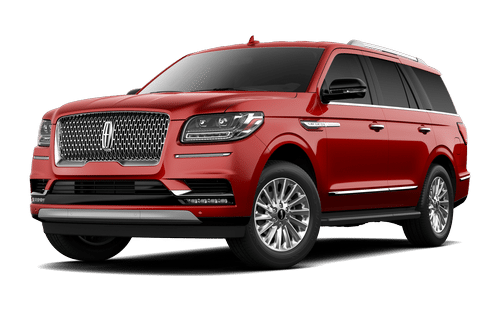 The Lincoln Navigator is a full size luxury SUV that’s fitted with a twin-turbocharged 450 horsepower engine and a 10-speed transmission. What’s more, the Lincoln Navigator provides six different drive modes to choose from. Contact one of our representatives and get a step closer to owning your Lincoln vehicle today! Merlin Lincoln invites the residents of Saskatoon to get your next stunning Lincoln Navigator from our dealership. We offer various services and add-ons like fresh oil and filter, new wiper blades, a full tank of fuel, and 6 months of prepaid service with Sirius XM. The Lincoln Navigator combines style and capability. It has an optional panoramic vista roof with first and second row consoles so both front seat and rear seat passengers can adjust it to suit their preferences. This SUV is equipped with power-deployable running boards. What’s more, it can tow up to 3,946 kg (8,700 lbs) when properly equipped. Check it out in our online inventory today! Merlin Lincoln is proud to have the largest on-site inventory in Saskatoon. We offer 24/7 overnight service and 24-hour Roadside Assistance to help you ensure your vehicle stays in top condition. The Lincoln Navigator is gorgeous from the inside out. Its auto-folding side mirrors project a welcome mat on the ground when you approach it. The door handles shine. The front and rear running lamps light up in a timed sequence, which adds a little glitz and glamour to your commute. It also has an optional LED-illuminated Lincoln Star logo that gives it a distinctive appeal. Tom Geenan went to every possible length to ensure we were happy and satisfied purchasing a new vehicle for my wife and growing family. Tim in finance was very easy and quick to deal with, and the entire team at Merlin did a fantastic job all around. For any of your new or used vehicle needs, get in touch with Tom Geenan. I know we will in the future. World Class! Keep it up! We have been looking for the perfect vehicle to meet our needs since September. We came in with a budget, and are very appreciative that Larry L, and Darryl B, found us the exact vehicle we've been looking for. I will say that looking for a family vehicle for 5 (which includes 3 booster seats) is no easy task. We did bring our children to test drive, and I'm very impressed with how family friendly everyone was with us. Thanks again Merlin! Your staff is amazing, and we love our new to us ride. I had an awesome experience dealing with Tom and Grant at Merlin. They were both super attentive and accessible for anything I needed, and I felt like they went above and beyond to make my vehicle purchase smooth and easy. Thanks guys!